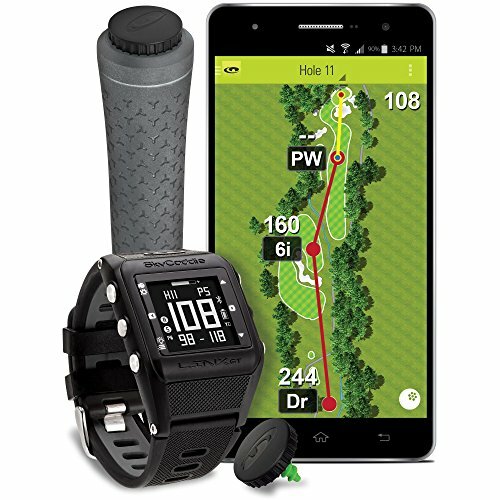 The SkyCaddie linxgt game tracking edition is Golf's first GPS rangefinder and shot tracking watch with synchronized mobile GPS app. At its core, the linxgt is a standalone GPS watch that features sky golf's best-in-class true ground course maps, preloaded to provide golfers with distances they know they can trust. For those looking to get the most from their game, featherweight RFiD smart Tags can install on your clubs in seconds. The smart Tags are used to identify each Club in your bag so that the linxgt watch and SkyCaddie mobile can track the exact Club used, distance and location of each shot. Here you'll see your round displayed on brilliant HD course maps. You'll know how far you hit every Club in your bag, where you hit each shot, resulting in better game management and lower scores. Don't want to use Tags for every round the SkyCaddie linxgt includes automatic shot tracking just in case you forget to tag a shot, which runs in the background while you play. All of your game tracking data wirelessly uploads to your "My 360" account in the sky golf 360 cloud. Once uploaded, you can review your round from any mobile or desktop device, without the need for a cable! what if you want to make an edit to a shot or add Club information no problem! SkyCaddie simple One-Touch editing system makes this extremely quick and easy! Golf's first three-in-one watch with quick GPS distances on your wrist, expanded view of the hole on your smart phone and shot tracking in real-time.